Phoenix Fiberglass Understands You Who Need To Go fast…That’s why all of our boats are built completely custom. Anything is possible. From a bare hull, a turn key rig, or anything in between, Phoenix does it all! 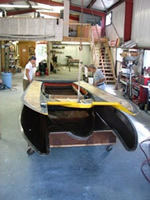 We feel it’s extremely important that you know your boat will be made in the original Cheyenne molds. Our Cheyenne is NOT a splash or copy made from another boat. 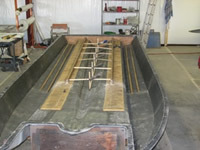 Using the original molds helps produce a boat which is straight and true….a proven performer and record holder. The process starts with the highest quality gel-coat. Your hull can be any color you desire; just send in a sample and Phoenix Fiberglass will match it. Multi Color Gel-Coat schemes are also available– We can even throw in some metal flake! Our hulls are completely hand laid from top to bottom, using only the highest quality materials.The placement of kiln dried White Oak stringers, and Baltek end-grain balsa in strategic places help produce an extremely light, extremely strong boat. After the reinforcement’s are in place and the curing process is completed, the deck and hull are popped out of the molds. The two halves are then glassed together to produce the strongest boat possible . A completed Cheyenne lake boat weighs between 450-500 lbs. Of course, full race hulls are also available, and generally weigh around 410 lbs. After the two halves become one and the finishing touches are put on the interior. 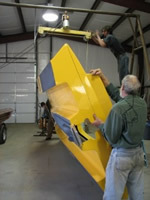 The boat is flipped and any bottom modifications which need to be done are completed. From there the boat is ready to rig. Phoenix offers full rigging services. From an intake set, to a turn key boat. Just call us, and we’ll build the boat that fits your needs. Copyright © 1996-2010 DragBoatCentral.com. All rights reserved.